To help you get to and from Vancouver and Whistler on event weekend, we’ve created travel and rider services that’ll make your experience as easy as possible. There’s a choice of buses that can take you and your bike up and down, plus free parking options and bag drop points so that you can simply focus on having fun. Southbound passenger and bike transportation from Whistler to Vancouver on FRIDAY, September 6th leaving 5pm. Bikes will be transported FULLY ASSEMBLED in a separate trailer. Pick Up location is at the Whistler bus loop (click here for map of location). 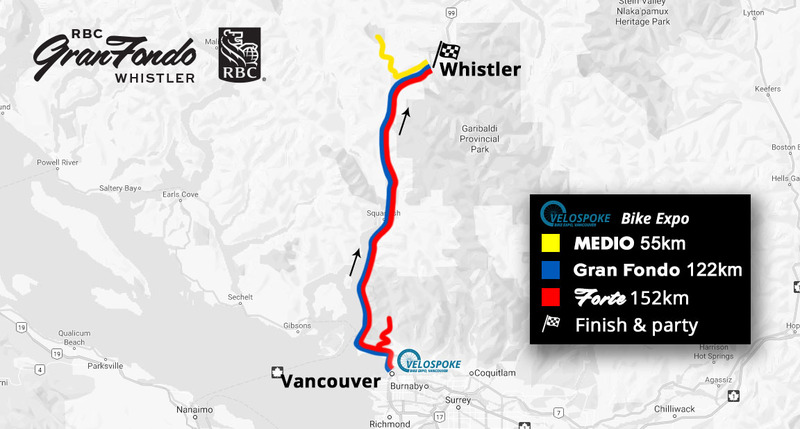 Drop off location is the VeloSpoke Bike Expo, Vancouver Convention Centre East at approximately 7pm. Pickup location at the Vancouver Convention Centre East (1055 Canada Pl, Vancouver, BC). Drop off location is the Whistler Gateway Loop. Pickup location at the lululemon Headquarters (1818 Cornwall Avenue). Drop off location is Lot 4, Whistler. Saturday transportation from Whistler to Vancouver will leave from Day Lot 4 at 4:00pm. Drop off location for this year will be at both the Vancouver Convention Centre East and the lululemon Headquarters, 1818 Cornwall Avenue. Estimated arrival time is 6:30pm. Please note that if you do not make it in time for the 4:00pm bus, we are working with Whistler Connection to make sure you get back down to Vancouver on Saturday. Sunday transportation from Whistler to Vancouver will leave from various locations and times from Whistler and Creekside. See below for pick up options. All buses will drop off at both the Vancouver Convention Centre East and lululemon Headquarters, 1818 Cornwall Avenue. Bikes will be transported fully assembled, so you do not need to box your bike! Simply leave your bike with our event team after you finish in Lot 4 and it will be waiting for you back in Vancouver on Saturday or Sunday. All bikes will be picked up at lululemon Headquarters (1818 Cornwall Ave) at the parkade. Any bike not picked up on the day they are transported to Vancouver is subject to a $100 storage fee. We will be transporting bikes back to Vancouver to be ready for pick up on Saturday, September 7th at lululemon Headquarters (1818 Cornwall Avenue). The bikes will be available for pickup from 6:30pm to 8:30pm. All bikes MUST be loaded onto the truck by 1:30pm in Day Lot 4 in order to be available for pick up on the same day. Any bike transportation purchased for Saturday that does not make it on the truck will be available for pick up on Sunday, September 8th from 10am to 5pm. There are limited spots available for Saturday bike transportation back to Vancouver. Bike transportation back to Vancouver to be ready for pickup on Sunday, September 8th at the lululemon Headquarters (1818 Cornwall Avenue) must be loaded into the truck in Day Lot 4 by 4pm on Saturday, September 7th. Bikes will travel back to Vancouver Sunday morning and be available for pick up from 10am to 5pm on Sunday, September 8th. IMPORTANT: Please remove all valuables and personal belongings from the bike such as bike computers, seat bags, etc. If you are concerned about scratches please pack protective foam wrap for your bicycle. It is understood by those utilizing this service that RBC GranFondo Whistler accepts no liability for damage or loss of property to bikes using this service. Any bikes that are not picked up on the day that they are transported back to Vancouver will be subjected to a $100 storage fee. We have partnered with lululemon to provide free parking in Vancouver. Parking is 2km from the startline at lululemon Head Office (1818 Cornwall Ave) and is available for parties of two or more only. Spaces are limited and must be reserved online in advance. Passengers using transport options from Whistler on either Saturday or Sunday will be dropped back off here. All riders can deposit one bag that will be taken to the finish line ready for pickup post-event. Complimentary bag checks are limited to one bag per person with the maximum size being 21.5 in. x 9 in. x 15.5 in. (standard airplane carry-on size). All riders must drop their bags off at Package Pick-Up on Friday Sep 6th, 2019 except for Alta Classe riders. For Alta-Classe riders, bag drop is both at VeloSpoke Bike Expo (Friday Sep 6) or at the start line (Saturday Sep 7) – please choose at your convenience. For all other riders, bag drop is at VeloSpoke Bike Expo, Friday Sep 6th. When picking up your rider package from VeloSpoke, you will be given a luggage tag that must be used when leaving your bag with us. Please note popular options will sell out in advance, so we advise to book early to avoid disappointment!